Ulster centre Darren Cave's hat-trick ensured Leicester's slim hopes of reaching the European Champions Cup last eight were quashed. Ulster, who went into the game bottom of Pool Three and with no chance of qualification, led 12-0 at the break courtesy of Cave's first two tries. The 27-year-old completed his treble before Craig Gilroy scored the fourth, Ruan Pienaar landing three conversions. Adam Thompstone's fine solo try offered little consolation for Tigers. 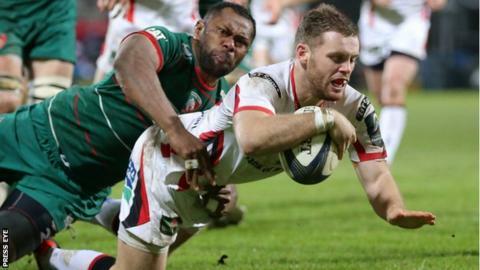 Ulster, who suffered a record 60-22 defeat by group winners Toulon last weekend, even managed to hold out with only 13 men on the field - with both props Callum Black and Wiehahn Herbst binned - late in the second half, and finished the game with only 14. The opening score came in the 19th minute when, with a penalty coming for a high tackle on Craig Gilroy, Ian Humphreys provided the assist for Cave who crossed the Tigers' line. Humphreys, though, missed the conversion and it was game on with the Tigers throwing everything into attack for the remainder of the half. Ulster's defence held firm despite being put under intense pressure and they turned defence into attack near the end of the first half to notch their second try, Humphreys making a half-break before passing inside to Cave to scorch over under the posts for his second of the night. This time Pienaar converted and Ulster went in at half-time leading 12-0. That quickly became 17-0 three minutes in after Mike McComish initiated the move by breaking free off a driving maul and, after moving the ball left and right, Cave got over for his hat-trick. Pienaar converted to make it 19-0 and the Tigers' hopes were all but gone, especially with Vereniki Goneva yellow carded in the 45th minute for what appeared to be a high tackle. The score became 26-0 shortly afterwards when Gilroy got over in the left corner from a scrum, with Pienaar converting superbly, as Ulster secured the four-try bonus point. The Tigers finally got on the board when Thompstone smashed over in the 53rd minute and Freddie Burns' conversion got the visitors going just before Goneva returned. Thompstone's score gave the Tigers renewed hope and, when Black was shown yellow in the 61st minute for lowering the scrum, the visitors sensed an opportunity as they were encamped near Ulster's line. They failed and then when Herbst was binned in the 71st minute, 13-man Ulster held out for several minutes before they finished with 14 on the park and with the Tigers well beaten and out of Europe. Ulster: Payne, Bowe, Cave, L. Marshall, Gilroy, Humphreys, Pienaar, Black, Best, Herbst, O'Connor, van der Merwe, Henderson, McComish, Wilson. Replacements: Herring for Best (74), Stevenson for O'Connor (65), McComb for Henderson (58), B. Ross for McComish (45), Warwick for McComb (61). Not used: C. Ross, P. Marshall, Allen. Sin bin: Black (61), Herbst (71). Leicester: Tait, Thompstone, Goneva, Bai, Benjamin, Burns, B. Youngs, Ayerza, T. Youngs, Mulipola, Kitchener, Parling, Croft, Salvi, Crane. Replacements: Morris for Thompstone (69), Harrison for B. Youngs (69), Rizzo for Ayerza (55), Ghiraldini for T. Youngs (55), Balmain for Mulipola (55), Barbieri for Crane (55). Not used: De Chaves, O. Williams.